Hassan Joho takes on DP William Ruto again claimed Jubilee overtook Likoni water county project. - Bana Kenya News, Real African Network Tubanane. Home Mombasa Hassan Joho takes on DP William Ruto again claimed Jubilee overtook Likoni water county project. 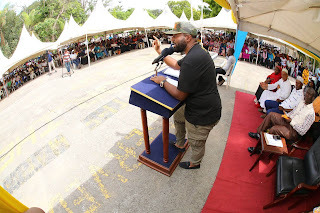 Hassan Joho takes on DP William Ruto again claimed Jubilee overtook Likoni water county project. The Mombasa Governor Hassan Joho has criticized the government again over county projects.The deputy president plans of launching the Likoni water project has been received with a lot of misunderstanding. Jubilee Government gimmicks continue in terms of legitimizing projects that are not theirs. The governor took the whole organized function as lack of something to open by the Government and now trying to flag or launching things that show desperation. DP William Ruto to launched the LIKONI DMA PROJECT sponsored by French government under Mombasa county. This project entails the creation of a new water network in Likoni to prepare Mombasa to absorb water. The project is a fully County Government of Mombasa’s initiative through the leadership of H.E Governor Hassan Ali Joho. The Governor signed the 2B Water Purchase Agreement in Paris in 2015 in the presence of the Minster for Water Wamalwa where the County Government of Mombasa took responsibility of this project. The county government of Mombasa has rubbished the claims that some the Projects launched by the Government in Mombasa are Mombasa county projects but Jubilee leaders need PR.